All Because Doug and Carrie make fun of Tyson....: Baby Gage!! Well, the long awaited arrival of my sisters baby, has come and gone, and this is the first time I've seen any pictures of him at all. I finally got into a family website that actually had pictures of him on it. Gage Arron Tarin came into this world September 27 at 11:32am. He weighed in at 7lbs 12 oz and 20.5 inches long. He had been home for a day and needed to go back into the hospital for an infection due to a little procedure he had done, but all are well now and he's hom and changing everybody's lifes. My mom had made it to Germany the day before Cymony went into labor and my dad made it to her house the morning she went into the hospital. Congratulations!! We are so excited to meet this little guy, although he probably won't be so little when we do meet him, seeing as he is half way around the world. Good thing for skype!! 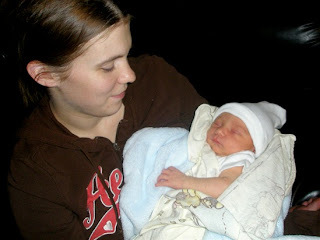 My sister Cymony and baby Gage. 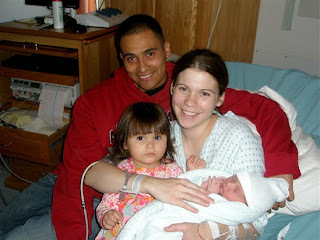 Thanks for posting a blog dedicated to baby Gage! I hope one day (soon) that we are able to meet each others little men before they are all grown up and off to college! :o) Sheesh! Ditto on Skype! Cute baby! I must say I was laughing at all your cereal we would have that much if Jared wouldn't eat it all so quickly. I am so glad you posted these pics, I only have 2 of him & it is just not nearly enough!